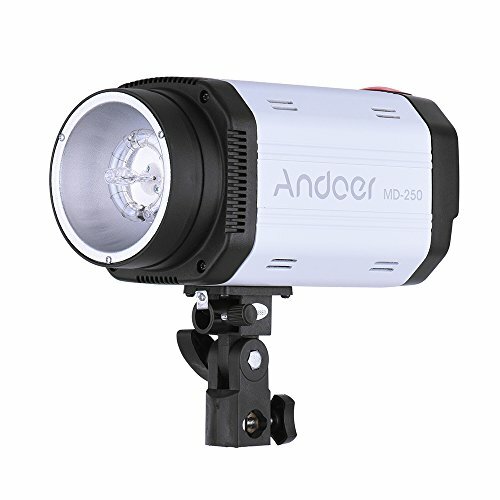 Andoer MD-250 is a pro studio strobe, high guide number and fast recycle time. It is controlled by the microcomputer chip, with the function of red eye reduction. 250W super power flash, 50W modeling light,high guide number of GN50. 0.5s-1s fast recycle time, standard color temperature of 5500K. Support 1.0-6.0 stepless adjustment, LCD display to show the flash output power. Controlled by the microcomputer chip, support charging complete buzzer prompt. Three triggering methods: sync cord, flash trigger and optical trigger. After each output adjustment, the flash will pre-flash once to get the best output effects. Aluminum alloy shell with numerous heat-dissipation holes. Triggering method: sync cord / flash trigger / optical trigger.